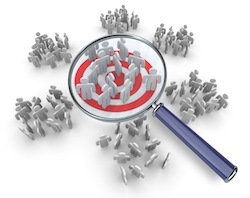 Although it’s one of the most important tasks of marketing, I so do not want to define my target market. I’ll bet a lot of writers feel the same way. Why? I wrote this book for myself. I was my target market. I am just getting accustomed to the idea of thinking of myself as a writer; I have certainly not been writing for anyone else. Thinking about a “target market” seems commercial, and taints the way I think about both my work and “my” reader. Which taints the way I think about myself. I know I shouldn’t feel this way, but I grew up in a culture (the U.S.A.) that has a love/hate relationship with commercialism. I hardly know where to start. Since the book wasn’t written for a target market, perhaps it doesn’t have one. What I have done is the exact opposite of the most basic business adage: Find a need and fill it. I have created the product before determining who might want it, and for what purpose. So where do I go next? Fortunately, my product is a book, and lots of people like to read books. So I’m going to assume there is a market out there, waiting for me to find it. My stories have been chosen by editors who are not me, and don’t owe me anything, to be published in various travel anthologies. My stories have also won some awards, in contests judged by professionals. But I still need to define my target audience. I will need a new phrase, because I hate thinking of people as targets. Maybe my audience will work. Or my readers. Who are they? Since the product came before the audience, I’ll need to figure out what my book is about before I can determine who will want to read it. So, what is my book about? This is where the elevator pitch comes in. I need one. Simple—three or four sentences should do it. But not so simple—what should they say? Now I understand why agents are not interested in a book without an overarching theme—without that, one isn’t sure what the book is about. And without knowing what the book is about, one cannot develop an audience. Fair enough. So what is my book about? I’m giving myself the assignment of writing an elevator pitch this week.